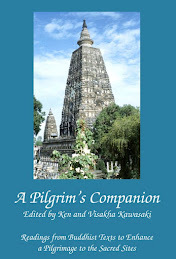 dhamma musings: How Did The Buddha Wear His Robe? How Did The Buddha Wear His Robe? 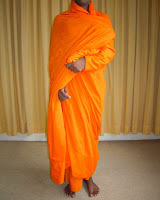 How did Buddhist monks in ancient times wear there robes? There were two ways, what might be called the open style and the closed style. The open style consists of wearing the outer robe around the body, under the right arm and over the left shoulder. 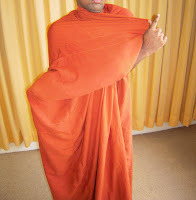 Even today monks wear there robe in this way when in their monastery. However, the Vinaya stipulates that when monks are in towns or villages or going to peoples’ homes they should cover both shoulders, which would be what I have called ‘the closed style’. But exactly how did this ‘closed style’ cover both shoulders? The closed style worn by all Theravada monks today seems to have evolved in Burma in the 14th/15th centuries from where it spread to Thailand, Laos, Cambodia and Sri Lanka. 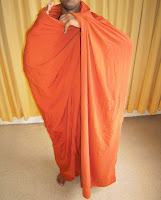 This rather complicated way of wearing the robe consists of rolling it into a tight tube around the body and opening out the top to form a collar, and holding it all together by pressing the robe between the right side of the body and the right arm (picture). Nothing like this can be seen in ancient depictions of monks from India and I haven’t even been able to find representations of it from Theravada countries from before the 14th/15th centuries. 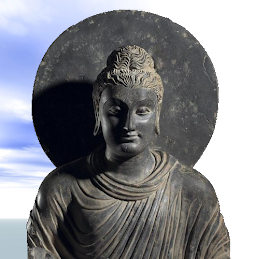 The earliest depiction of the ‘closed style’ comes from Gandhara (northern Pakistan, north-east Afghanistan) from between the 1st to the 4th centuries CE. 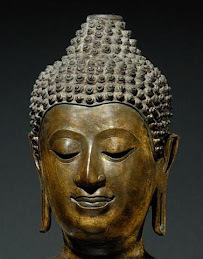 Gupta period (3rd-5th centuries) sculptures from northern India depict the Buddha wearing his robe in the same way. This ‘closed style’ shows no join in the robe which hangs loose at the front, drapes over the upper-half of the body and a corner of the robe is clearly seen in the Buddha’s left hand. How is this done? Well, like this. Take the top corners of the robe and hold them out in front of you (picture 1). (Several hours of trying to upload this and the next picture have failed so you will just have to imagine what I am describing). Put the left corner of the robe down behind the right sholder (2). Put the right corner of the robe under the edge of the robe and down behind the left shoulder (picture 3). As you do this, take the edge of the robe at the right elbow, bring it across and ‘hook’ it over the left shoulder (4). As you do this it is essential to keep hold of the left corner of the robe. (If you don’t do this the whole thing will come undone). You will then find that part of the robe is hanging down your right side. Pull it over to the left and tuck its edge into your belt and Walla! 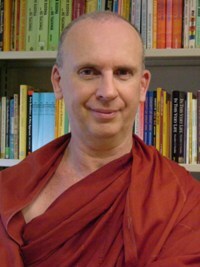 You have your robe in the same ‘closed style’ as it was worn by Indian monks at least at the turn of the first millennium and quite possibly as it was done at the time of the Buddha. And the whole procedure takes less than a minute. This is in fact how I remember the outer robe was put on from my time in Burmese monasteries. Thank you for this post. 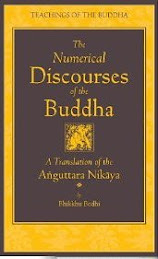 Did the Buddha teach that only ordained monks may wear the Buddhist robe, or may anyone who follows the precepts wear the robe, as the Buddha implies when he says that the robe does not make the monk, the monk makes the robe (i.e., following the dharma makes the monk, not the robe). What are the original Pali teachings about this? I'm really into the issue, but still couldn't figure out how to wrap it. Could you update the instruction with more detailed illustration (perhaps a video clip or more step-to-step pictures)? Thanks in advance!